There was not a single piece of land anywhere in sight. The lads looked dull and unhappy. As a Captain, I had to quickly find a way to appease them with good food. Taking out me looking glass, I spotted a peculiar ship in the distance. Alerted, I ordered the lads to be on guard. However, this peculiar ship turned out to be a restaurant on the seas. Amazed and hungry at the same time, I welcomed its appearance and prepared for a mid sea trade. Island restaurants or sailing restaurants, who cares, as long as they feed me grub. Noodle play is a Takeout restaurant much far from my home. It was the talk of the town and obviously I was intrigued in it. Then, I was referred to Hitesh Bhatia who is the owner of this brand by fellow connoisseur Shwetaa Sharma. I was told that they do not have a dine-in facility as they specialize only in home deliveries. This disappointed me a bit initially because I am located quite far from them and it would have been very hard for them to deliver it out here. However, Hitesh's "never say never" attitude amazed me. He said without hesitation that he will have it delivered it to my place. I was skeptical about the whole thing. But I was silenced with noodles and chicken, literally. Pritam, who mans Noodle Play's logistics, gave me a call and a confirmation was made for next week. Moving on to next week, it was a Tuesday and I had completely forgotten about the whole affair. I was planning to go get my grub from the local fast food place when suddenly my phone buzzed. It was Pritam and he notified me that my order will reach me shortly. And it did. A few minutes later, Noodle Play delivered the goods on my door. It was impressive that the food was still warm, given the distance. Not luke warm, not burning hot - Goldilock's kind of warm. Packed in a neat and compact manner, the cargo looked great at delivery. A pair of chopsticks, a fork and a spoon were among the things included. These guys really worked hard on presentation and the delivery. I started my meal with good spirits. In a top secret food facility somewhere in Area Ikyavana(इक्यावन), An aging food scientist manages to successfully blend Indian and Chinese cuisines using the Large Foodron Collider. "Eureka", he screams before handing out his secret to select restaurants in India. He hoped that his creation will help humanity and hungry people everywhere. It is a long known tradition in India where foreign cuisines are often adjusted for Indian tastes. They may be saltier or have Indian spices. May even have pure vegetarian variants which otherwise don't exist in the country of origin. However, the worst part about them is that they claim to be authentic Chinese and do injustice to both cuisines. 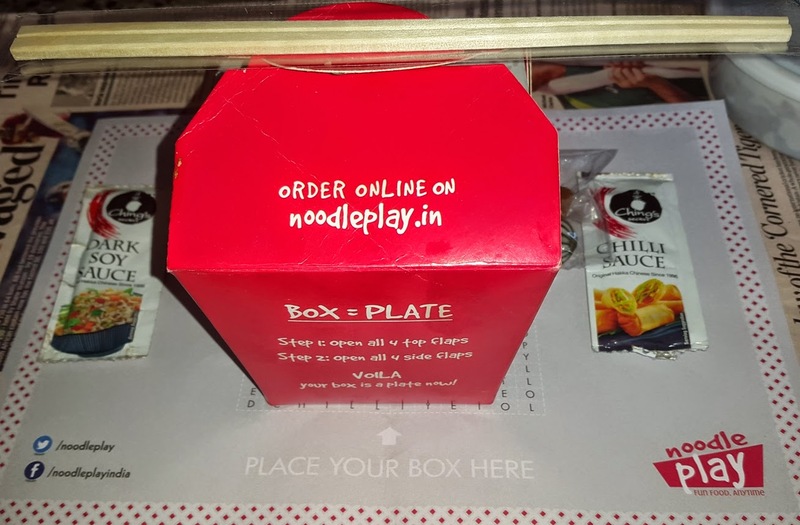 Noodle Play happily admits that it blends the two cuisines and does a great job too. It does total justice to my totally true story about Area Ikyavana. 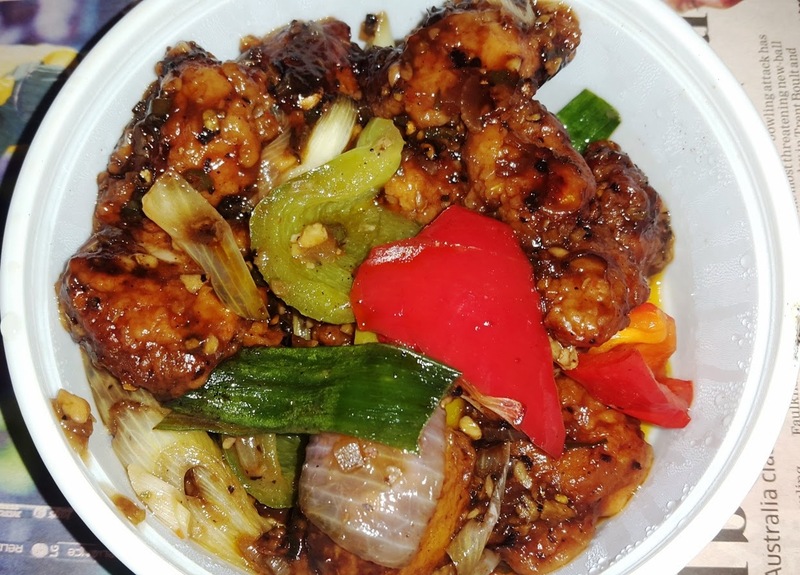 The Black Pepper Chicken had more Chinese and less Indian influence as compared to many other items on their menu. The fresh vegetables, black pepper sauce, rich spices and the marinated chicken were a perfect team. Together they could take on any taste buds in the world. Indeed, the flavor was great with the succulent chicken able to satisfy the cravings of every carnivore. And the aroma and the presentation were great too. To be honest, for a takeout place this dish had quality on par with most fine dines. And at a fraction of the cost. Captain : I love this chicken. Crewmate : You look a little clumsy with the chop sticks Captain. Captain : I know how to use them....I just am not very good at it. Then I opened the Wok Box of the never ending Burnt Chilli Garlic Noodles. All right, the never ending part was a jest but the noodle quantity in one box easily surpasses the hunger levels of two average human beings. The content was less oily, pleasantly aromatic and with an addictive garlicky flavor. 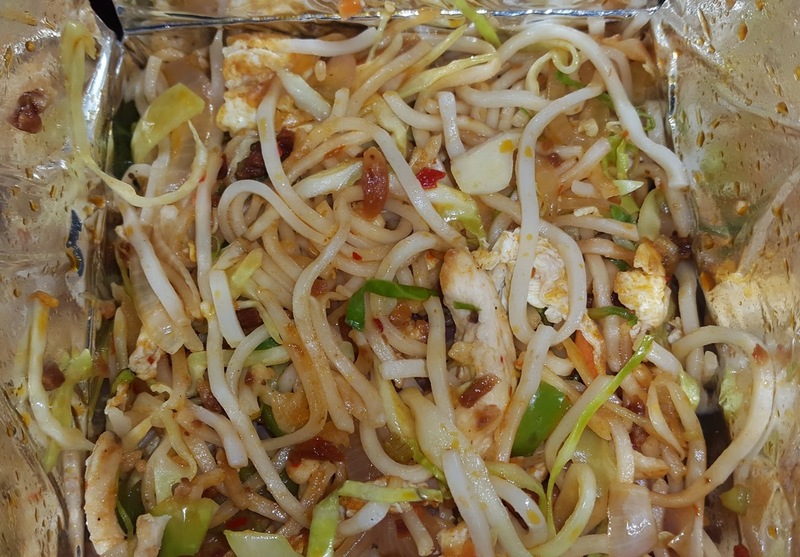 Loaded with Chilli chicken and a hint of a smoky flavor, this is the best takeout noodles that I have ever had. The vegetables were added in just the right amount with an artistic touch. Sometimes, the treasure is box of gold coins and sometimes, the treasure is a box of golden noodles. Especially if it is a wok box. It served as my lunch and also my dinner, such was the huge quantity. And what came as a surprise was that at dinner even in its cold state, it was still tasty. Don't know if this was by design or co-incidence but there are very few places that can cook food that tastes good in both hot and cold states. Captain : There is enough grub in this treasure chest to feed the whole crew. Crewmate : But you will probably have it all alone, right? Captain : No lad, its too much even for me. Crewmate : Thundering Typhoons, Its a miracle. Captain : Get off your Belgian Comics lad. 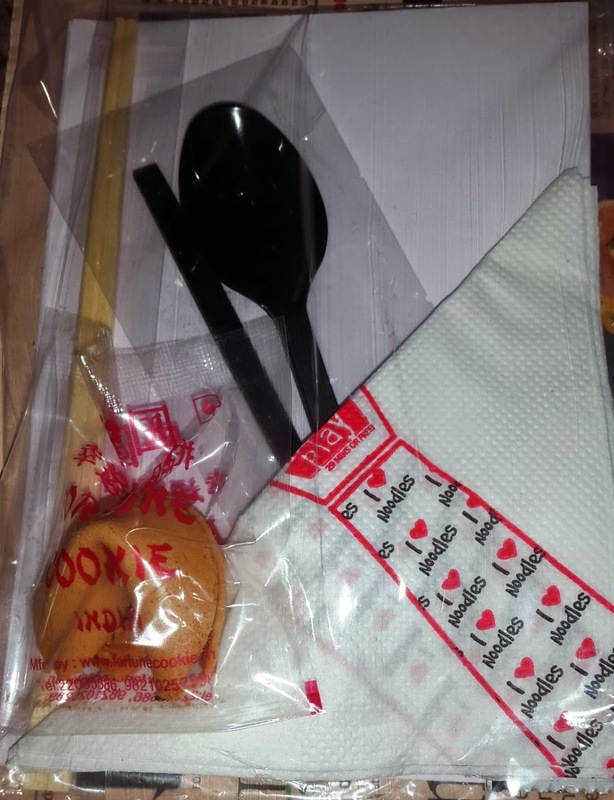 The food was delivered with a lot of accompaniments like a Fortune cookie, Imli Chooran and a Mint Ball. Also included were some puzzles, just in case you are traveling while eating and are really bored. Why look at the weird guy sitting opposite to you staring at your food when you can look at the intriguing puzzles. Let me help you out with the first answer - Lollypop is hidden at the bottom right vertical of the word puzzle. Concluding, I would say that it would be quite cool if Noodle play gets a dine in restaurant but it really delivers on food and service (no pun intended). The prices are really low. Almost half of what I get from my local places and the quantity is almost double. That is a value factor of 4x. "All right lads, you had your fill even in the middle of the sea. Time to get back to yer stations. We have a long voyage ahead of us." They will deliver if you lie within their area of operation. Your blogsite version of this piece is way too much more interesting than the Zomato one. The dollops of humour infused within give it an altogether different dimension. And I like the way you describe every item of food you had had. You give a very clear picture and I know now what I can have from this place and what not. Kudos.